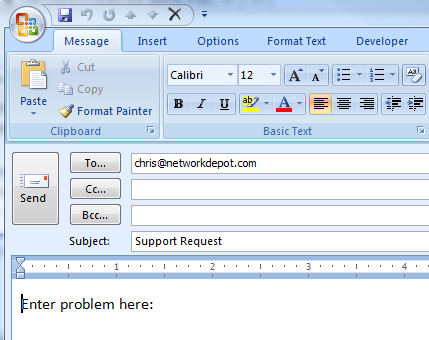 Ever wanted an easy way to get your clients to send you an email when they need support? Why not use the Kaseya icon? 1. 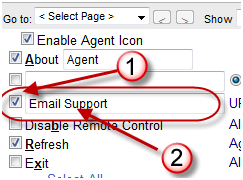 Go to Agent Tab, Configure Agents, and select Agent Menu. 6. When the user clicks on this, the default email program will open up a new email, and the appropriate fields will be populated. Done! Now you just need to educate your clients. Once in a rare while we run across a client that has a proxy server and wants to use Kaseya. 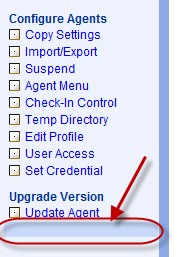 In version 5 of Kaseya, it was a hidden menu underneath the “Update Agent” entry off the Agent tab. (Hold down the ALT key and click the area below). In K2, it moved. After emails to support we found that it now hides near the top of the Agent Status page, between the “Select Columns” and “Filter” button. When you click on this, you will actually open a new .asp page (IE recommened/required). At the top of the page you can enter the Proxy Server information, including port and login information if needed (bullet #1). Then you can apply those setting to the system(s) (#2) as required.